C H Slade on Newbury War Memorial. 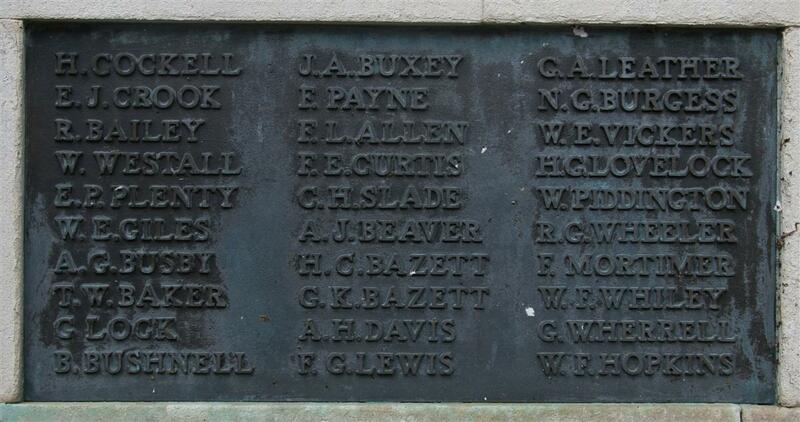 C H Slade is remembered on tablet 9 of the Newbury Town War Memorial, however extensive research has failed to find any serviceman of that name either from Newbury or connected to Newbury. The problem is exacerbated a little by the knowledge that errors were made during the memorial’s refurbishment in 1950 when the bronze name tablets were added to replace weathered stone tablets. In this process it in known that some names were incorrectly transcribed resulting in occasional changes of the initials of the casualty. However, in the case of C H Slade this does not seem to have happened; the programme for the unveiling and dedication ceremony in 1922 includes C H Slade on this tablet. Over 200 casualties with the surname Slade are recorded on the Commonwealth War Graves Commission’s Debt of Honour database. Four of these have the initials C H, five C and eight H (it is not at all uncommon for a casualty to be recorded by only one of multiple initials). Where known, the database also records next-of-kin details – about half of the CH, C and H Slades have such information, but none of those suggests any local link. The Active Service Roll of lads from the Newbury district who were serving in the forces by spring 1916 contains only one Slade – Private H Slade of the King’s Royal Rifle Corps. This is Samuel Henry Slade, known as Henry, whose name is remembered on tablet 10 of the Newbury memorial and on two memorials within the parish church of St Nicolas, Newbury. He is the only Slade remembered on these parish memorials. William James Slade appears on the Aldermaston memorial and a Mrs Slade’s efforts in support of Hungerford’s war effort is recorded on the roll of honour commemorating all those from the town who served their country during the conflict. These are all the Slades recorded on memorials in West Berkshire. Whilst it remains a possibility that further evidence will come to light that will identify C H Slade, there is also the possibility that the name is, in fact, there in error. Perhaps the compiler of the casualty list had two submissions for Samuel Henry Slade: one from the family, correctly identifying his unused first name, and another from an employer or friend who thought he was Charles or Christopher. Or even a submission from a family member whose handwriting made an S look like a C? The compiler would then see that he had two Slades to commemorate, not one. If you have information or a clue that could help to solve this puzzle, please contact us via the email address shown on the Contacts page (see menu above).